The East Coast gas supply crisis is driving gas prices up, with prices forecast to increase substantially from current levels. But what can be done to mitigate what could be an economic disaster. This gas shortage crisis has been all over the news lately, especially following Prime Minister Turnbull’s announcement that gas exports would be restricted. Some people believe the government’s stance is long overdue given the predicted gas shortage is now a reality, and a shortfall of gas is expected by 2019. Meanwhile the oil price is reducing the CAPEX in the industry, making the domestic problem worse. 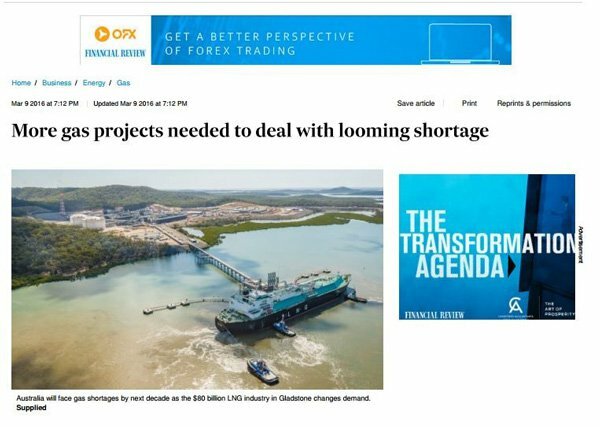 Headlines like those above can only play into a company like Real Energy’s (ASX: RLE) hands as it looks to commercialise gas supply that can mitigate domestic shortages. RLE went some way to meeting this aim after it signed a non-binding Memorandum of Understanding with Santos Limited today which would allow raw gas from RLE’s Windorah Gas Project to be processed into sales gas, which can then be supplied to the east Australian gas market. Of course it is early days in this agreement and the outcomes are speculative at this stage, so investors should seek professional financial advice for further information if considering this stock for their portfolio. With a focus on exploration and development of oil and gas acreage in the Cooper-Eromanga Basins in southwest Queensland — Australia’s most successful onshore region for oil and gas production —RLE has discovered a large gas resource and is now ready to bring its Windorah Gas Project into production. Windorah is close to infrastructure, is 100% owned and this $15M capped company is currently well funded with over $6 million ready for deployment towards successfully commercialising its two existing wells – Queenscliff-1 and Tamarama-1, and undertaking further exploration of its huge gas deposits, known to be locked up under RLE’s ground. RLE’s immediate focus is on the Toolachee and Patchawarra formations, which are well known to hold gas and are prominent throughout RLE’s tenements within the Cooper Basin. RLE is verging on recording a huge Resource, which could be the basis on which to develop its Windorah Gas Project. RLE is taking a calculated risk at striking a multi trillion-cubic-feet gas Resource onshore Australia. If RLE manages to get its hands on something even closely resembling that, it could welcome JV partners from a position of strength, as well as being able to generate huge sums in sales revenues. Currently RLE possesses 13.76 tcf estimated total mean gas in place, which means there is multi-well development potential here. Given RLE has already had interest from gas buyers most notably Santos, any commercial deal would be a key value driver for this stock. Currently trading at around just 1c/GJ on the ASX, there’s the potential RLE will develop into a significant player in the Aussie gas supply chain as demand pressures are weighing down from both home and abroad. For a company actively reporting improving flow rates and pulling the pieces together to commercialise its Windorah Gas Project — we think RLE may just be worth a closer look, particularly in this changing macro climate. 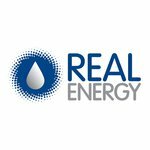 Real Energy (ASX: RLE) is a simple, straight-forward shot at gaining exposure to a potentially large onshore gas resource in Australia. We’ve been tracking RLE, and its chances of hydrocarbon success over the past few years. In our last update, ‘ RLE to Frac in Coming Days as M&A Activity Hots Up’ , published around this time last year, RLE was gearing up to begin an extensive fracking program. Since then, RLE has confirmed a significant gas discovery in the Cooper Basin and is continuing to progress exploration and development activities at Windorah. The pieces are coming together as RLE works towards commercialising its project. In late January, RLE recommenced operations at the Tamarama-1 well and has successfully brought the well on with intermittent free-flowing operations. Tamarama-1 is proving up the Basin Centred Gas concept and is a key step in RLE’s efforts to commercialise the Windorah Gas Project. RLE is now witnessing a stronger and faster build-up of pressure and more gas flowing to surface from Tamarama-1. It intends to continue to flow the well to enable it to collect and determine reservoir performance data as it works towards commercialisation. Its non-binding MoU with the $7.5 billion capped Australian mining giant Santos to supply raw gas from Windorah to be processed into sales gas and then be supplied to the east Australian gas market is a big step forward for the company. Santos and its joint venture partners have gas processing facilities at Moomba in South Australia and RLE and Santos, as Operator of the Moomba gas plant, have agreed indicative terms for gas progressing and transportation services. The terms of the agreement form the basis for a subsequent formal binding agreement which could inevitably support the economic development of the Windorah Gas Project. RLE has also agreed in principle to swap geological data for its wells for geological data for a nearby well drilled by Santos. The MOU with Santos could give RLE a clear pathway to commercialisation without the need to build an expensive gas plant and other associated infrastructure. With sufficient cash in the bank, RLE is now in a position to make its aspirations a reality. The company appears well funded for the foreseeable future, buying enough time to realise the ultimate potential of Tamarama-1. ...and importantly, when and why the current east coast gas crises plays right into its hands. You may have seen a lot in the news about the east coast gas crisis lately. The Federal Government is finally acting to stop organisations exporting much needed gas out of Australia, which has sparked domestic price rises. As big corporations look set to fight the ban, doors open for smaller explorers to serve an east coast market that’s crying out for supply and price pressure alleviation. RLE could be in the right place at the right time: holding a large acreage position in a highly prospective area. And RLE is well positioned to combat the tight market environment. In the latter part of 2016, RLE successfully concluded recompletion operations at the Tamarama-1 well at the Windorah Project. Tamarama-1 was drilled as an exploration well and has proved up the concept of Basin Centred Gas for the Company. The results are a key step in RLE’s efforts to commercialise the Windorah Gas Project. Here’s the latest news regarding RLE’s efforts at Tamarama-1, where RLE explained that it is beginning to witness a stronger and faster build-up of pressure and more gas flowing from the well. Over coming weeks, RLE will continue flowing the well, looking to recover increased gas and less fluid. 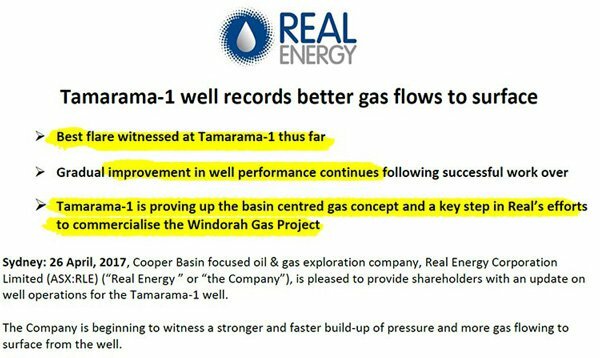 This news follows an update on the progress at Tamarama-1 from March 8, 2017, where the company said Tamarama-1 well has been free flow, producing gas and fluids to surface with rates fluctuating due to fluid interference. 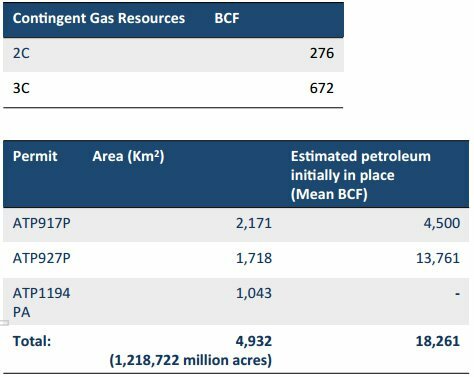 Notwithstanding this interference, the total estimated cumulated gas production to date after various periods of flow and pressure build-up is in excess of 67 MMcf (million cubic feet) together with about 11,000 Bbls of fluid. Tamarama-1 is proving up the Basin Centred Gas concept and is a key step in RLE’s efforts to commercialise Windorah. RLE has a large position of 4,932 square kilometres, which is 100% owned, in the Cooper Basin — Australia’s premier onshore gas field. RLE’s initial focus is on the exploration and development of unconventional gas and oil resources and conventional oil in the Cooper and Eromanga Basins. The main unconventional plays in RLE’s current asset portfolio are condensate-rich gas interpreted to be trapped as a continuous gas play in the Permian sedimentary sequence within the area of ATP 917P, ATP 927P and ATP1194PA, and gas play in the Eromanga Basin section, developed in all three permits. A total of 1,218,722 acres is a huge swathe of land for RLE to utilise. It could decide to vend in other partners or pursue the development and exploration of its acreage – hopefully at a premium to the current share price. That’s what we like to see with our prospective junior oil picks — lots of optionality and good chances of success when drilling. Of course this is still a speculative stock and investors should seek professional financial advice before making an investment decision with regard to this stock. Mapped out below is RLE’s location and tenements, dissected one by one. Its significant permit areas at Windorah — ATP 917P, ATP 927P and ATP 1194PA — can be seen towards the top right of the map in blue. Note the other major operators in this promising region. The main focus is ATP927P which has a large gas resource on it and is in close proximity to infrastructure so discoveries can be commercialised. Located 100km north-west of Eromanga, ATP 927P comprises four separate blocks with a total area of approximately 1,718 square kilometres. RLE has drilled 2 wells – Queenscliffe-1 and Tamarma-1, both gas discoveries. There have been about 12 wells drilled in the adjoining blocks – all described by their operator as future gas producers. RLE believes that there is a basin centred gas play throughout most of ATP 927P which is lateral extensive and these wells prove up this play. ATP 1194PA comprises 1,475 sub-blocks, covering an area of approximately 1,043 square kilometres. The block is located south-east of the town of Windorah and has a number of gas plays. 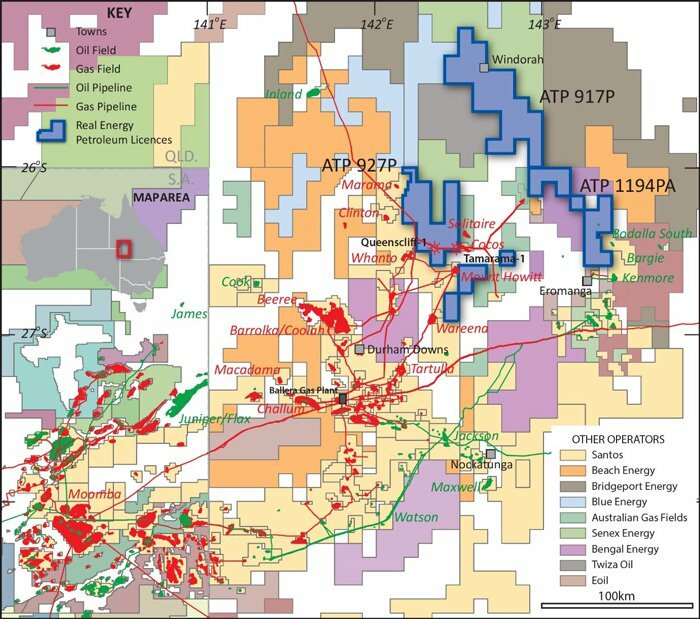 ATP 917P is a single contiguous block comprising an area of approximately 2,171 square kilometres, located approximately 200 kilometres north-west of Eromanga in South West Queensland. ATP 917P is located in a significantly under explored but prospective region. It is considered prospective for oil in the Eromanga Basin and tight gas in the Cooper Basin. Seismic coverage is sporadic and only three wells have previously been drilled in the permit. That’s right folks, RLE is playing for some huge stakes and here is what RLE is aiming for. RLE’s permits cover over 4,000 square kilometres, yet RLE is most interested in the unconventional gas seams. The main play RLE is chasing is the Toolachee and Patchawarra formations and it intends to initially focus these two formations, which have high organic content of up to 30% TOC, and are Basin Centred Gas plays. In addition, there is a large shale gas play throughout the Toolebuc shale formation that exist in all these tenements. The Toolebuc shale is not only rich in gas, but also oil and there is a significant quantity of shale oil throughout the tenements. Previous drilling has intersected the Toolebuc formation through the Cooper-Eromanga Basins with significant oil and wet gas shows. Not every explorer is able to take a promising project from hope to commercial success. And it involves much more than just the right geology and a supportive supply-demand balance. RLE is giving itself its best chance of success, by making sure it has its financial and business operations under control. With $6.1 million in cash, the company is well funded to continue operations at its Windorah Gas Project. The figure includes a cash refund of $1.49 million received in January 2017 from the Research and Development (R&D) Tax incentive for 2016. The company has also been proactive in its signing of an MOU with Santos, a large industrial and commercial gas user — a major ASX-100 company in fact. This company is keen to buy gas on a long term basis from RLE. A deal like this — a long term agreement with a major customer — would be a great step for RLE. However any talk of future revenues is pure speculation – so its recommended investors seek professional advice should be sought if considering RLE for your portfolio. RLE is eager to raise its level of exploration activity, its news flow, and hopefully, its valuation. Its field operations are moving along nicely, while flow rates improving at Tamarama-1. This all adds up to RLE staying firmly on track in its quest to turn the promising geology into commercial dollars. 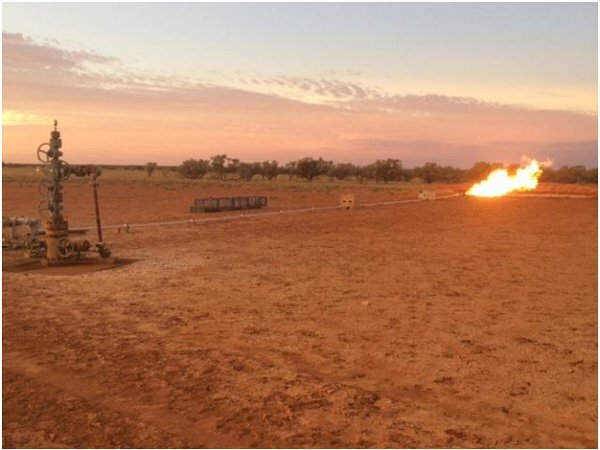 RLE is running Tamarma-1 on extended production test and closing in on the commercialisation of its gas Resource. This is a vital step toward the commercialisation of its Cooper Basin project, which is surrounded by heavy hitters in the energy industry. This $15 million-capped hydrocarbon junior is hoping to reward its patient investors with something very alluring later this year, so we’ll be keeping an ear close to the ground for RLE’s news. If RLE confirm a resource of over 13 billion TCF — which is entirely feasible — it could prove to be just the catalyst this small cap needs to garner attention from the wider market.